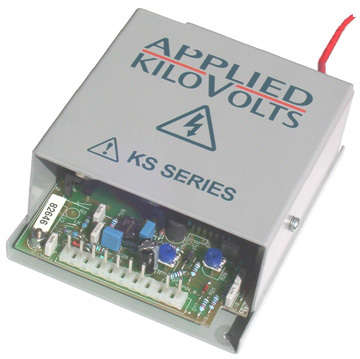 These stabilised miniature power supplies are available in either positive or negative polarity at output voltages of 5kV, 10kV, 20kV and 30kV. They are intended for cathode ray tube and general purpose applications and the output voltage can be controlled by internal or external potentiometers or by and external 10 volt analogue control voltage. The units are pin compatible with the high precision HP series and the 100Watt HW series of power supplies. All units are short circuit proof and use high frequency switching techniques, in conjunction with a ferrite step-up transformer to control the output. All high voltage components are vacuum encapsultaed in silicon rubber. Please contact us to discuss special versions of these units. The KS Series is now UL recognised (E254121). +24 volt d.c. ±10% at less than 0.5A. Negative input terminal common to HV earth return. Less than 0.1% for input changes of 1 volt. Less than 0.1% for load changes from 10% to full load. (Measured at maximum voltage). Flashover and short circuit proof. Voltage monitor: 0 to +10V represents zero to maximum output, tolerance ±3%, (source resistance 10 kohm). Current monitor: (Stack return type) Optional on all units. Choke input filter. Steel case for low radiated magnetic field. M3 clearance holes. Bracket AK20035 available for end mounting. Molex 10 pin, mating connector supplied.